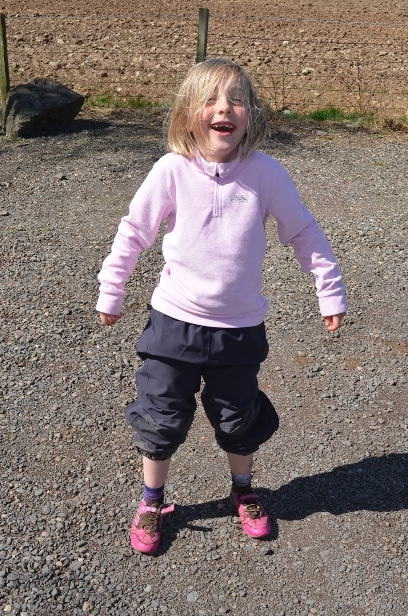 You know how normally I blog about our outdoor pursuits elsewhere and only mention the epic parenting fails here? Well, settle down with a cuppa – this is a long one. “Let’s go for a little walk”, The Boss and I suggested to the minxes. 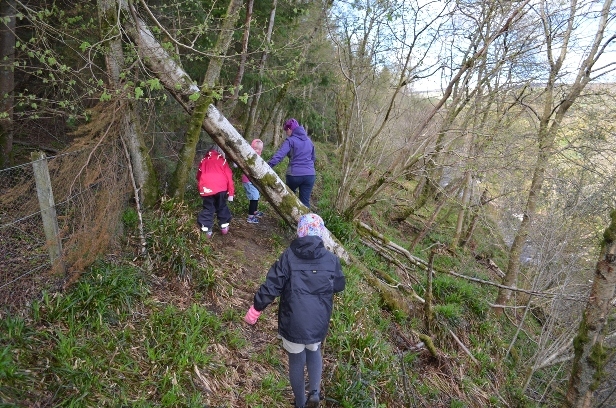 “Let’s go see what this bit of the map looks like in real life”, pointing to a gorge, a waterfall and a picnic site near the ruined Edzell Castle. 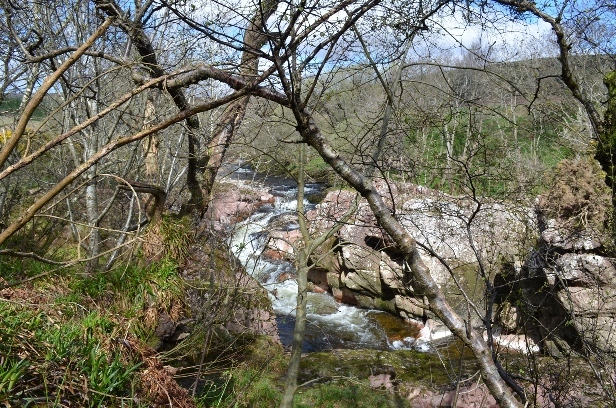 We hinted at the possibility of ice-cream in Edzell afterwards, and promised Midi that it was nowhere near Glen Esk – the scene of our last couple of epics. And that’s all it took to persuade the minxes to come out walking on a blustery, chilly Saturday. 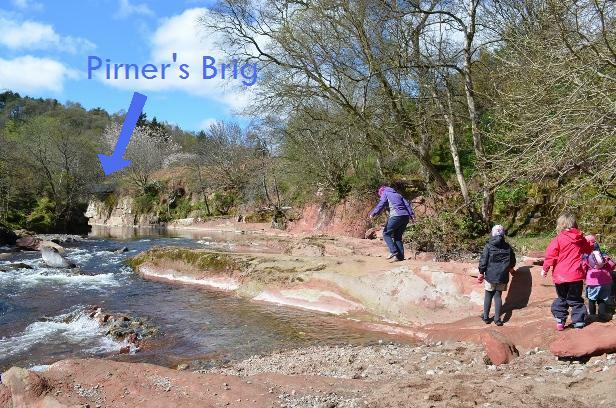 After parking at the picnic site, we walked down the steep steps to the River Westwater and spent a while skimming stones and clambering all over the bright red sandstone. We’d have stayed longer but for spotting a little bridge further upstream. “Aha! Adventure beckons! Let’s just go explore the bridge”. The bridge – Pirner’s Brig – did indeed tick all the ‘perilous’ boxes: the floor was a wide-spaced metal grille; the metal sides wobbled and didn’t feel as if they were attached very securely; in fact, I couldn’t see how the bridge was attached to the sides of the gorge at all! Worse, there was a deep gap at the base of the sides that my panicky imagination could foresee one or more minxes slipping under and falling to their doom in the rapids below. (Please tell me I’m not alone in my hysterical inner anxieties?) Still, I put on my Let’s Have An Adventure face and bravely urged the minxes to walk ahead of me (just in case I bottled it at the last minute). As feared, the bridge also wobbled when we walked, so I’d score it a 7/10 on the Britain’s Scariest Bridges scale. On the other side was a deep, dark wood. We could see 3 thin little tracks heading in different directions. Now, we knew that we only had a single bottle of water with us and a single plastic pot of chocolate snacks – the rest were in the car – but we weren’t going to be long, were we? The sight of mountain goat tracks heading out of sight uphill was just too intriguing – we had to go have a little explore. Oh ok – *I* had to go have a look, dragging the others reluctantly with me: they’d have been quite happy to go back to chucking stones in the river. It was only me who really wanted to see what the waterfall in the middle of nowhere looked like. One track led straight to the deep, fast-flowing river (eep…! ), one to a gate and a lumpy steep field, and the other led up along the side of the gorge. Normally I’d have balked at taking the minxes up such a narrow track with a steep drop on one side and slippery weeds on the other, but I’m still trying to stretch my Over-Protective Parent muscles, so I led the elephant train, Mini clinging tightly to my hand and Midi and Maxi using fallen branches as steadying sticks. Eventually it got too scary for me, so the minxes and The Boss huddled in the dank cold while I trekked on ahead to check out the footing. It looked like a bird track ahead! Halt. About Turn. We picked our way back to the tracks junction and decided to try hopping over the gate in case there was a track on the other side that met up with the gorge track. Now at this point, we probably should have nipped back for more water and snacks. And maybe the map that was decorating the dashboard. But we were all in waterproofs and now all quite keen to find the elusive waterfall to make this un-fun walk worthwhile. It couldn’t be much further, could it? Maybe 20 minutes of careful foot-placing later, we found the waterfall. I felt cheated: it was more like a stretch of river rapids. Pretty, but no dramatic waterfall. Hmph. We decided to share the chocolate snack and water before heading back and crossing the waterfall off our list of places to return to. Rather than eat in the dark woods, though, we decided to walk a little further to the big empty field past the fenceline we could see and maybe rest for a bit in the sunshine. First we had to clamber over the barbed wire fence. Someone had built a stepover with boulders on either side of the fence and helpfully left a big stick leaning against it. I showed the girls how to use sticks to carefully balance over the wire, then they all had a go. Yes, this probably used up too much time. After eating the little snack and almost finishing the water, we realised that we were all a bit tired and quite cold. None of us relished walking back the cold, dark, slow way we’d come. The thicker wood that flanked the track didn’t look too deep: perhaps we could walk up the empty field a little, then sling a left and walk around the outside of the wood, left again and back down towards Pirner’s Brig, then to the warmth of the car and hot coffee and lunch? Excellent idea – surelythatt would be much quicker? So off we plodded. In fact, Midi and I had a little race up the lumpy hill. We go to the edge of the wood. Ah. The wood didn’t end there – just the fully-grown trees. The fenceline stretched on uphill with little saplings dotted everywhere. 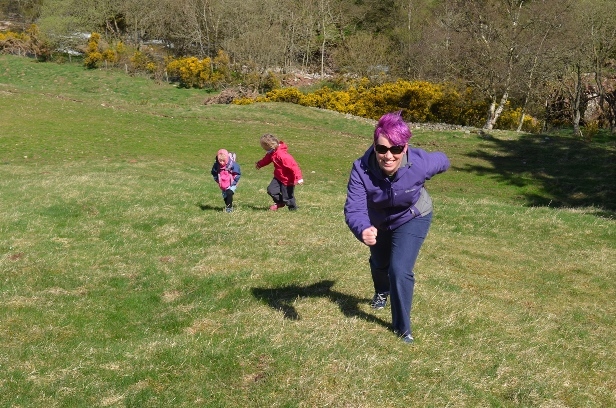 Explaining to the girls that the Outdoor Access Code meant that it would be wrong of us to trample through the plantation, we decided to plod on further uphill. Oh come on, you know us by now – it never works out like that, does it? We got to the end of the wood and discovered that the next field was entirely surrounded by a double electric fence. Could we cross it somehow? Ought we to? No and no. The Boss whipped out his phone and pulled up a satellite image of the area while we shivered in the now-harsh wind. At least the sun was bobbing behind clouds so it didn’t matter that we’d left the sunblock stick with the food and water(!). We could see a chicken farm just ahead and a farm track leading out of it that went roughly in the direction we wanted to go in. The satellite image showed a track leading in from this road, though we couldn’t actually see it because of the hedgerows. Hmmmmm. OK, let’s walk just a bit further. I had huge misgivings, wondering whether I should insist on us just turning back. I bickered with The Boss for a while in frustration and taught the kids some new swear words to horrify their teachers with next week. We got to the access track. It was gated, and the gate was tightly fenced over so it was un-climbable. I looked around. Then up. I could see that the fluffy cumulus clouds had suddenly turned into thundery clouds with hazy icy edges and that in fact there was a wall of falling rain coming towards us. Oh.You.Are.Kidding.Me.On. Not again! Why does this happen every time we come here?! Sod the Access Code – I needed to get our kids to warmth and safety right now! I was up and over that gate like a skittishly panicky mother, then caught the minxes as The Boss threw them over to me. We strode down the track to the chicken farm. I half-expected to be met by barking dogs or an angry farmer. The smell of chicken poo got stronger and we were stepping in more and more of the stuff, so I suggested we walk along the very edge to minimise disturbing (we assumed) free-range chickens: I’d visions of us causing a stampede and mass chicken death and really being in trouble. Instead, the chickens were all indoors, gently clucking. Would chickens stampede and panic if they smelled us? Could they smell us? Did they give 2 hoots what we got up to?! We didn’t take any chances and walked around the downwind side of the chicken-house. It was eerily quiet, with no sign of humans. Or dogs. We trotted happily down the exit track to the next field and gate, glad to be closer to the car. Well, we WERE glad, until the hailstones hit. Big ones. Hurty ones. They stung us along the field to the top of the next hill. 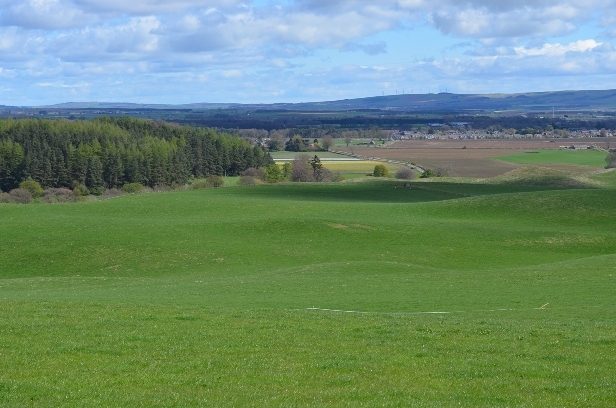 I spotted that the direct route to the final gate and Pirner’s Brig was along an exposed ridge, but decided to detour and walk in the shelter of the hill’s deep contours instead. Hoods up and hunched over against rain and hail, we tiptoed around cow-pats, fearful of meeting some overprotective cows and calves. Finally we spotted the gate, the river and on the other side: the car! Ah, safety! But first, we had to cross some muddy puddles. Could we walk round them? The hill was too steep to walk around uphill; downhill would probably be just as mushy; ah well, it’s only a few minutes to the car – let’s go through them! I instantly regretted my decision as I sank past my ankles in bog (natural springs, the map described it later). I had a hysterical vision of me sinking under forever leaving an indignant bubble. I subscribe to the belief that if you’re moving fast enough you won’t get wet, so sheer momentum took me across. Luckily Mini, who was still clinging to my hand like a flag in the wind, was too light to sink too far and she just got wet feet. One by one, we all discovered just how icy-cold the bog water was. I could tell by the 3 different tones of wailing that the minxes really weren’t happy at all. Situation Normal at the end of most family walks, then. Once quickly over the gate, we slithered down the path to the Brig. Who cared about the steep drop to the river? Who cared about the mud? 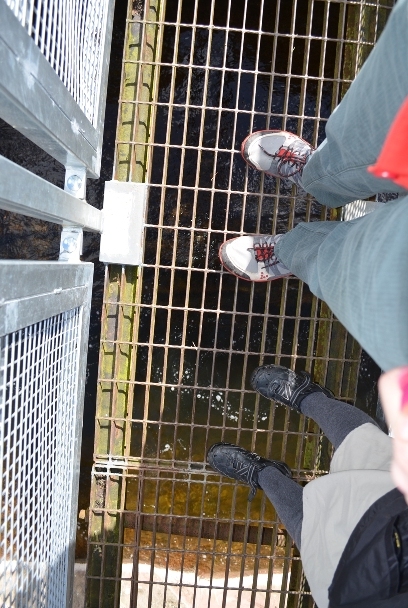 One last big bit of bravery to cross the bridge, then just a few strides more to the car. We giggled euphorically as we stripped off muddy kit in the empty carpark and guzzled chocolate and coffee and water. At least we’d been wearing fleeces and waterproofs so I hadn’t worried about hypothermia! But my biggest Note To Self: there really, honestly, genuinely is no such thing as “Och, we don’t need x, y, z – we’re only going on a teeny wee walk”. This entry was posted in Conundrum, Mummy Guilt, Out and About and tagged caught in the rain, children, country walks, epic, hail, Outdoor Access Code, risk assessment by GrumpyOldTrout. Bookmark the permalink.